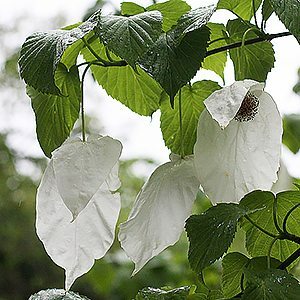 Davidia involucrata is an outstanding ornamental tree commonly called the Handerchief Tree, Dove Tree or Ghost Tree. Originally from China, has been in cultivation since the mid 1800s when the French explorer, missionary and botanist, Father David, first brought back seeds. The tree gets its botanical name from him. The main attraction are the amazing flower bracts, two on each actual flower. The flower itself is small and redish in colour, the bracts are large and white. This is a tree that is slow to get to flowering size and besides the species, two other forms are identified, Davidia involucrata var. vilmoriniana and Davidia involucrata Sonoma, which flowers at a much earlier age than the others. Best grown in cool to temperate climates, Davidia involucrata is grown in the UK, Europe and in the milder areas of the USA. If is featured in parks and gardens and makes an excellent deciduous shade tree. Best grown in a humus rich, well drained moisture retentive soil. It will grow in full sun to part shade, however best not exposed to hot drying winds. Flowering time is in late spring, depending a little on the climate. The flowers fade and seed pods or fruit are formed, these will fall to the ground and will take around two years to germinate. The fruit are not edible. This is not a tree that requires pruning as it naturally forms an attractive shape. Over time it will reach around 10 metres (30Ft) in height. It will form a wide spreading crown given appropriate space. 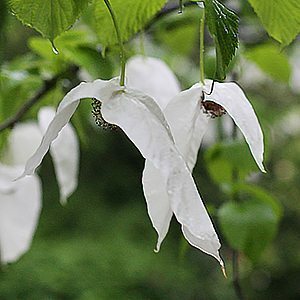 Common Names – Dove tree, Handkerchief Tree, Ghost Tree. Height – Generally 10 metres. Spread – Will form a crown of 5 metres. * Not to be confused with Maniltoa browneoides also known as the “Handkerchief tree”, this is an tropical evergreen species from New Guinea.